Yarn and Fiber Happenings: Cascade Yarns on Sale and A Free Shipping Coupon for You! Cascade Yarns on Sale and A Free Shipping Coupon for You! Pretty, Pretty! Our wall of Cascade 220 is fully stocked for your shopping convenience! Shop our full range of colors - Yes! We carry every color of Cascade 220 yarn for your shopping convenience, all the time! 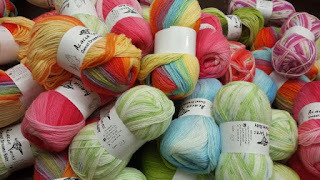 - and we are offering a 10% discount off all of our Cascade yarn lines through the end of April! Like Free Shipping? Enter coupon code FREESH10 at checkout and receive free regular standard shipping on your instock orders through the end of April- no minimum purchase required! Need a quick project to keep someone warm this Spring? 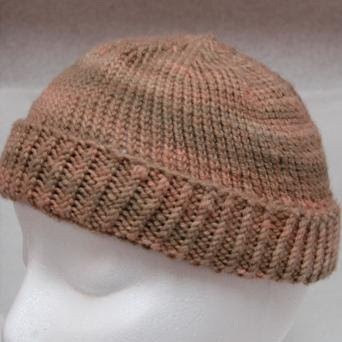 Try the Spiral Knit Watchman Cap Pattern! Just one skein of Ivy Brambles Superwash Wool and some US Size 8 needles and you have a cap perfect for ladies or gentlemen who need a light hat to keep off a chill! Hat pattern is written for sizes Children through Adult. A prize winner for the March Prize Giveaway has been notified and we are waiting to here back - please check your emails; we hope to hear from our winner soon! We will soon be posting a new prize giveaway for the month of May so be sure to sign up soon for your chance to win great prizes!